Located in Kilgore, Comfort Suites Kilgore is within a 5-minute drive of World's Richest Acre Park and Anne Dean Turk Fine Arts Center. This hotel is 1.2 mi (1.9 km) from East Texas Oil Museum and 1.3 mi (2.2 km) from Van Cliburn Auditorium. Make yourself at home in one of the 61 air-conditioned rooms featuring refrigerators and microwaves. Complimentary wireless Internet access keeps you connected, and cable programming is available for your entertainment. Conveniences include desks and coffee/tea makers, as well as phones with free local calls. Enjoy a satisfying meal at Chilis serving guests of Comfort Suites Kilgore. A complimentary buffet breakfast is served daily from 6 AM to 9 AM. 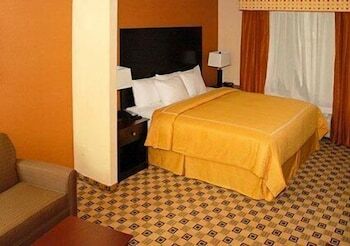 Featured amenities include a business center and laundry facilities. Planning an event in Kilgore? This hotel has facilities measuring 753 square feet (70 square meters), including a meeting room. Free self parking is available onsite.